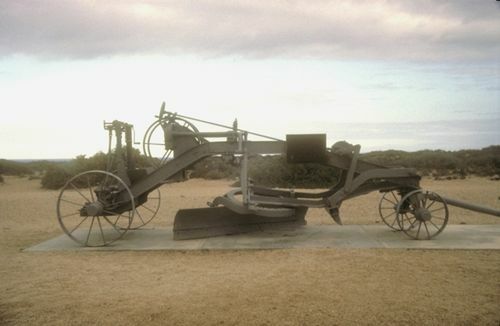 A road grader commemorates the opening of the last sealed section of the Eyre Highway in 1976. The tiny border settlement of Eucla became the centre of an extensive live television coverage today when the last sealed section of Eyre Highway was officially opened. Thousands of viewers in Western Australia and South Australia saw their respective Police Ministers Mr O`Connor and Mr Virgo, cut a tape across the road to officially break the last physical barrier to travel between eastern and Western Australia. The ceremony attracted hundreds of spectators and jammed the highway with cars. The Federal Minister for Transport, Mr.Nixon, said in Canberra yesterday that the new link was one of the most important in the national highway system joining the capital cities of .Australia. "This historic achievement would not have been possible without the Commonwealth's initiative in providing South Australia with the considerable financial assistance necessary", he said. The Canberra Times (ACT), 30 September 1976.